NASA has rescinded an invitation to the chief of Russian space agency Roscosmos, Dmitry Rogozin, to visit its Houston facilities and speak at Rice University after members of Congress noted that Rogozin is currently prohibited from travelling to the US under sanctions imposed over the situation in Ukraine, CNN reported. Rogozin was a deputy prime minister of Russia for the Defence and Space Industry from 2011-2018, and a hardline nationalist figurehead of the Russian far-right, before he assumed his role at Roscosmos in 2018. He was also one of several prominent Russian politicians slapped with visa restrictions and asset freezes in mid-2014 amid Russia’s occupation and annexation of Ukraine’s Crimean Peninsula. Thus the invitation by NASA administrator Jim Bridenstine (which would require a temporary waiver so he could enter the US) raised more than a few eyebrows. As Politico noted, there was no pressing reason to invite Rogozin to the US, and speaking at a “prestigious American university is an honour that the government has not bestowed on other officials it has sanctioned.” Additionally, Rogozin’s assignment at Roscosmos sparked some suspicion that Russian President Vladimir Putin was at least partially trying to undermine sanctions implementation by appointing a sanctioned individual to a job that requires close coordination with US officials. Critics included members of the Senate and LGBTQ advocacy groups concerned the NASA invitation would legitimise Rogozin, who has a long track record of trashing the LGBTQ community, among other expressions of bigotry. Administrators at Rice University said they had no plans to host Rogozin, despite Bridenstine putting it on the cancelled trip’s itinerary. “After receiving feedback from the Senate, we have rescinded our invitation to Roscosmos Director General Dmitry Rogozin,” Megan Powers, the press secretary for NASA, told CNN late Friday. NASA and Roscosmos have worked together for decades, and currently, the latter agency maintains the only launch vehicle certified to deliver U.S. astronauts to space, the Soyuz system. 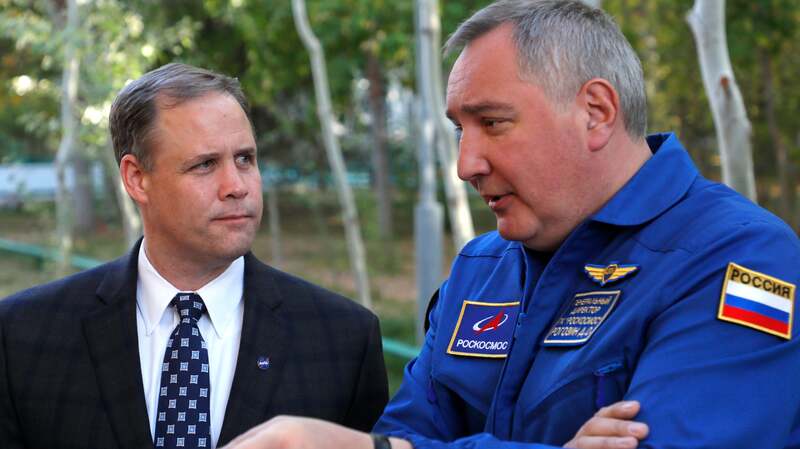 Though Rogozin threatened to terminate the agencies’ working arrangement after being hit with the sanctions in 2014, the Washington Post reported, he and Bridenstine apparently “bonded over their affinity for aviation” during a trip to Russia in 2018. Bridenstine then apparently made an impromptu offer for Rogozin to come to the states, and by his own admission “did not consult with the White House on inviting Rogozin or then rescinding the invitation,” the Post wrote. While Bridenstine previously justified the invite by saying he wanted to insulate US-Russia cooperation in space from politics, the resulting headache has done just the opposite.